The text descriptions in the survey describe residences in several ways in a column headed ‘Closes Names’. The survey distinguishes in its description of dwelling places between homestead and house. Generally ‘homesteads’ referred to the farmhouse and surrounding land of substantial farmers in the town. House usually referred to non farmers, of whom many held grazing rights in the moors but no other land. However the dwellings of at least three substantial farmers were described as houses, so presumably had no farmyard or extra close attached. House on waste (HW) - again presumably with no garden; on the waste is taken to mean built on unused land not already taken up by closes and therefore effectively reclaimed from scrubland or road-side verges. Homestead etc (HSE), homestead and home close (HSC), homestead and garden (HSG) or house and homestead (HHS) - generally these are larger plots than those for houses and are occupied by tenants with other holdings (fields). However some homestead plots are very small and may indicate a previously higher status (e.g. William Pawson at 288). The occupants (or in some cases perhaps their descendants) of a number of the ‘house and garden’ plots are listed as tradesmen in the 1793 trades directory. Many are in the Market Street/Place area and probably mark the significant development of house/shops as trade developed and the community as a whole became less self sufficient after 1586. Occupation details of the houses are described and locations justified below in geographical order, within street areas. The numbers refer to land parcel numbers in the terrier; missing numbers in a sequence indicate there was no building on that plot. Hmestead/house etc in the town are listed in the order used for the 1586 maps. Click here for the map of Bingham Town in 1776. The map does not distinguish between types of building (house, homestead etc). Elizabeth Wilson. She also had grazing rights on Meadow Moor (1.27 acres), Far Littlemoor (0.72) and two gates on Bull Moor, all to the north of the parish. The closes behind her house were owned by Mr Bradshaw, but we do not know which one. John Brooks. He also held Nether Close, immediately north of 377 and a field adjoining the Fosse Road named after the track alongside - Doubleday Lane. John Timms jnr. He held a total of 105-acres scattered around the parish. Some of his closes were termed meadow, so we can assume he was a mixed farmer of some substance. Interestingly he did not have grazing rights on the ‘common meadows’ nor gates onto Bull Moor. Two buildings are shown on the plan, both of which may have been houses as in 1586 John Ludlam had two tenements here. The 1793 directory lists a John Timm as a maltster. In 1795 this Timm owned the Needham property at the west corner of Market Street/Long Acre which his widow sold to George Baxter to develop Market Street and Union Street. Later occupants were maltsters and wine merchants and the house eventually become the Vaults Hotel. The only table tomb in the churchyard is for William Timm (‘a native of this town’) and his wife who were from Whatton. He was born in 1753, so could well have been son of John the farmer/maltster. William Selby. He had a couple of roods worth of grazing in Far Littlemoor. Listed as sundry freeholds with no indication of a building. The 1776 plans show a building on either side and the tithe map shows a line of buildings here so it seems reasonable to assume there was one here, but it is by no means certain. John Hind. He had no other holdings. In 1793 a Thomas Hind was a tailor, so perhaps this was John’s trade. Jesper Doncaster. He had a close in Chapel Meadow and grazing in Far Littlemoor. This was described as ‘bakehouse only’, and was occupied by Robert Grant. There is no plan. We have positioned it here to fit in with the plot numbering sequence. The present cottage on the site was a bakery (the ovens still exist in the basement). It could not have been on the site of the Tudor bakehouse at the east end of Market Place as the 1776 plans clearly show a shared house at plot 46 there. 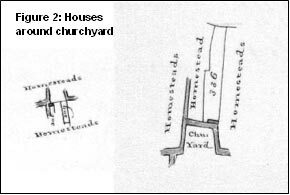 Grant had nearly an acre of grazing in Far Littlemoor and a freehold homestead (272) where number 2 Long Acre is now. Being freehold there is no plan for that, but one must assume a house there as clearly he did not live at the bakehouse. John Devoral. This was his only holding. There is no plan. The 1793 directory shows John Deverall as a cooper. Widow Bakeley. This was her only holding. There is no plan. No information was given for this plot except that it was tenanted by James Horsepool. It was James’ only holding and we have to assume it would be a house and maybe a garden. The plot was only .02 acres (about 850 square feet), hardly enough for anything else! John Bass. He held an acre of grazing in Far Littlemoor and four gates on Bull Moor. He also had a homestead at 273 and a house at 298. Presumably he sub-let two of the three, or relatives lived in them. 367 (HG)	 George White. He also held a couple of roods grazing in Far Littlemoor. The 1793 directory shows George White as grocer and chandler. 369 (HG)	 William Wheatley. He held the two-acre Ludlow Close (1.87 miles away on the far side of New Lane alongside the Grantham Road) and a couple of roods of grazing in Far Littlemoor. Mary Parr. She held closes at Cunnery Nook (Starnhill warren) and East Meadow and an acre and a half grazing in Far Littlemoor. She is shown as having two homesteads of approximately equal sizes – the other was at 269, on Long Acre adjacent to her (presumed) son’s holding 270. Buildings are shown on both plans. Thomas Pacey. He held 208 acres. This was the precursor of Beauvale House. John Hargrave. He held Oldwark Close (5-acres, near Margidunum). House and Yard held by Thomas Pacey, possibly as a tied cottage to his farm at 354 and thus used by one of his labourers. George Bradshaw held 47 acres in seven closes, in a contiguous group at what is now Brocker Farm. The plan shows the location of 350 is consistent with the modern Crown Inn. No Bradshaws were listed in the1793 directories; Richard Whitworth was listed as an innkeeper (but no inn name given) but we assume this would be the Crown (or Kings Head as it was then) as Whitworths were there in 1822 and later. Francis Culley. This was his only holding. These plots are not arranged in a numerical sequence. Figure 1 shows each individual plan – there was not one for 353 – from which the disposition on the conjectural map is deduced. Half of the house was occupied by Richard Keyworth and the other half by William Mellows. Keyworth had a 3.8 acre close and 1½ acres of grazing in Far Littlemoor. Mellows had two closes totalling over 4 acres. Everitt Little, who was listed in the 1793 directory as a farmer (father or son of Richard, see 265). He held 24 acres in four closes and two shared meadows (with Richard). Everitt and not Richard was listed as a farmer in 1793. Richard Skinner. He held another homestead (291) which joined with this one to the south. He was listed as a farmer in the 1793 directory. William Pawson. This was his only holding despite being described as a ‘homestead etc’. Thomas Eden. He held 28 acres in all including the two hop yards, grazing in Far Littlemoor, Meadow Moor and Meadow Moor Menders, four gates in Bull Moor and three scattered closes – part of the ‘old’ warren at Starnhill, the triangular Town End Close (where the 1920s council houses are now) and Mill Holm on the boundary of the parish near Margidunum. The homestead on Market Place became a farmhouse and yard later. 282 (HG) John Wrath. He had another house and garden at 337 and held a five-acre close in East Meadow and grazing in Near Little Moor and Far Littlemoor. This property preceded 1 Market Place (now Bird’s bakery), which was built in the 1820s. John Wroth is listed in 1793 as a miller. As he had another house, maybe this was a shop. Richard Gamble. He held around 4 acres – a small close alongside Moor Lane and another on Chapel Meadow alongside Chapel Lane. He also had an acre of grazing in Far Littlemoor. The deeds for 1 Market Place include a plan which shows this property as being occupied by Mary Gamble. Until the 1980s it was a butcher’s shop and supposedly always had been since at least 1841 – perhaps Richard Gamble was a butcher and ran stock on his meadows. Thomas Clifton. He had a five-acre close in East Meadow and an acre of grazing in Far Littlemoor. Thomas Clifton snr and jnr were in the 1793 directory as joiners. John Tindle. He had no closes but held grazing rights in Far Littlemoor and Meadow Moor and had four gates onto Bull Moor. Mrs Needham. This was Sarah Needham who also owned the next-door homestead and was matriarch of a very successful Bingham family (hence Needham Street). It seems unlikely she would have lived here, so we assume this was rented to others to occupy. No plan was given so the position we show is entirely notional. Thomas Brown. He had no other holdings. Browns had become an established extended family by 1841 when a Thomas Brown had a blacksmiths workshop here. Daniel Bakeley. He held nearly seven acres, with one close at Whinhills and grazing in Meadow Moor, Meadow Moor Menders and Far Littlemoor together with two gates onto Bull Moor. In the 1793 directory Daniel Beakley is listed as a butcher which would be consistent with the grazing rights and the possible use of Whinhills for fodder production. 283 (FHLD)	 Shown as sundry freeholds with no plan. Perhaps the most likely house is the 18th century farmhouse behind the present buildings on Market Street, the gable end of which is now a white goods showroom. By 1841 the whole of this area was owned by the Chesterfields, so whether we are right on 283 is maybe open to question! It could be that at some time after 1796 the estate took the opportunity of purchasing what must have become a prime site. The rectory was built in 1771 by John Walters, the then incumbent. It was demolished in March 1964. James Widowson. He held an acre of grazing in Far Littlemoor. A James Widdeson is listed as a joiner in the 1793 directory and the 1841 census lists James Widdowson as a joiner, shown to be at this house in the tithe apportionment. In 1914 the Earl of Carnarvon sold the southern part of the plot to become a garden to number 7 Church Street. The rest seems to have been absorbed into the rectory site at some point and now forms part of the grounds of Robert Miles School. There is a seventeenth century mud wall on the western boundary. William Spencer. This was his only holding. That this house (now 7 Church Street) was shown as rented from the estate is confusing as it is known from the deeds that it had been the freehold of the Shelton family from at least 1683. John Baxter. He was a framework knitter and Parish Clerk in 1793. This was his only holding. He was one of the amateur theatrical performers who used his barn as a theatre in the 1780s. Described a ‘Town House on the waste’, no occupant is named. 339 (H)	 Mary Vickerstaff. This was her only holding. That this house was rented from the estate is confusing as it is known from the deeds of 19 Church Street that it had been freehold (of William Hill) from at least 1700. The close to the north (343) is correctly described as freehold. The land behind (north of) 339-342 was described merely as ‘sundry freeholds’ which we know were under different ownerships. John Lee. He operated the mill on Tithby Road and had an acre of grazing in Far Littlemoor. Interestingly, a later miller, William Hemstock, also held this house in 1841. Might it have been the estate miller’s tied cottage? William Brooks. He held 93 acres including four contiguous fields in Brackendale and substantial grazing on Meadow Moor and Menders and both Far and Near Little Moors. He also had closes on Chapel Meadow. He held house 309, along the path south of the churchyard, as well. Clearly a man of some substance, he is not listed in the directory of 1793. An old cottage (Seymour Cottage) stands on the plot now. John Bass. He also owned the freehold to parcel 230 (described as a homestead) and had 4 acres of grazing in Meadow Moor, Meadow Moor Menders and Far Littlemoor together with four gates on Bull Moor. He also had house 366 on Newgate Street. Richard Brown. He had an acre in Far Littlemoor. Ann Gissop. She had 7 acres of grazing in Meadow Moor and Menders, Far Littlemoor and four gates onto Bull Moor. She had just a house and garden in the town. Robert Gissop (302) and William Gissop (301) who were presumably related to Ann are also listed. John Pilgrim. He kept the Chesterfield Arms (although it was called the Royal Oak at this time) and is in the 1793 directory as an innkeeper. He had ½ acre of grazing in Far Littlemoor, possibly for change horses as this was a coaching inn. 293 (HG)	 Daniel Parley had a small amount of grazing in Meadow Moor and Far Littlemoor and one gate on Bull Moor. In 1793 he was a mercer and draper, but presumably kept some stock as a sideline or for family sustenance. The locations of 305 and 303 are known from the survey plans to be at either end of Cherry Street; eastwards plots 307 and 308 are similarly fixed. There are no plans for the four cottages that must have been in between so the positions are conjectural. The boundaries we have chosen owe something to the tithe map but are significantly different to the terrace of (three) Victorian cottages now at the north end. It is clearly not possible to arrange the houses 301, 302, 304 and 306 in sequence between the known locations of 303, 305, 307 and 308! Robert Gissop. This was his only holding. See 295 for Ann Gissop. John Bakeley. This was his only holding. See 284, 252 and 364 for other Bakeleys. Mary Watson. This was her only holding. William Gissop. This was his only holding. See 295 for Ann Gissop. George Widnall. He held 7 acres which included (unusually) a non contiguous ‘home close’ (part of what is now Warner’s Paddock), and two other closes. Dane Cottage is the successor house. 299 (HSE)	 Samuel Baxter. This was his only holding and there was no plan. We have placed it on the site of a building on the tithe map. He is may have been related to (probably father of) William Baxter at 300. William Brooks. He held 46 acres including four contiguous fields in Brackendale and substantial grazing on Meadow Moor and Menders and both Far and Near Little Moors. He also had closes on Chapel Meadow. He held house 305 as well. Clearly a man of some substance, he is not listed in 1793. The previous rectory, an old cottage at 2 East Street, stands here now. John Wrath. He held another house and garden at 272 in the Market Place together with a 5-acre close in East Meadow and an acre of grazing in Far and Near Little Moors. A John Wroth is listed in the 1793 directory as a miller. Might that mean he was a baker first and that the property in Market Place was a bakery? (There was at least one other, of course) Two buildings are shown on the plan, one of which may have been a barn or some such. Mary White occupied the house together with 1½acres of grazing in Far Littlemoor. The plan for this house (figure 2, right) clearly shows there to have been a pathway around the churchyard, which was a common feature with town churches. The figure also shows the plan for 309 which seems to indicate a narrow path (a line) rather than a road. Matthew Stevenson had no other holdings. Richard Devoral also held 244 in Long Acre East. A Richard Deverall was listed in 1793 as a carrier. James Wickham. He held 84 acres and some shared grazing with Askew and others and four gates on Bull Moor. He was listed in 1793 as a farmer. Thomas Chettle. He held 100 acres with no shared grazing. James Johnson. He held 37 acres with no shared grazing. Joseph Askew. He had 70 acres and was listed in the 1793 directory as a farmer. He had eleven closes in four groups and shared grazing at Toothill with the Littles and in Chapel Meadow with Johnson et al. 315 (HSC) Daniel Stafford. He was a schoolmaster and father of John, a schoolmaster in 1793. He also held 3 acres in two closes nearby. The plot (8 East Street) now has a much altered 18th century farmhouse. John Harrison. He held four contiguous ‘Thorough Bridge’ closes, east of Granby Lane and just over an acre of grazing in Far Littlemoor. John Horsepool (note different spelling to others). This was his only holding. There was no plan; it could have been Donkey Green’s Cottage. In 1793 a John Horsepool was a tailor. Francis Marshal. He held two closes (327 and 321) immediately north of the house and garden. He also had ¾ acre grazing in Far Littlemoor. Described as sundry freeholds, this is formerly the main part of the Porter estate. There is no plan. We believe they had a manor house on Crow Close (to the north of this building) in 1586 but moved later to this farmhouse, the position of which is shown on the tithe map. This was east of the main town and not shown on some of our smaller maps. William Green. He held two homesteads and home closes (see 310) and the plans show a building on each – one may have been a barn. He also had just over an acre of grazing in Far Littlemoor. Widow Oliver. She held over 9 acres in two other closes. Mrs Chettle’s freehold. There is no plan. However perhaps the freehold area can be assumed to be the same in 1776 as in 1841, in which case Mrs Chettle’s freehold in 1776 is the same as John Crooke’s in 1841 (for which there is a positive correspondence between map and apportionment). It is now Holme Lodge which was part of the Chesterfield estate in 1925. The 1586 record demonstrates clearly that it has not always been part of the Estate as has generally been assumed. It was still freehold in 1841. Richard Devoral. He also had a ‘house only’ at 334 (in East Street near the church). This was described as a homestead but as there is no plan we do not know if there was actually a house here.. In 1793 a Richard Deverall was listed as a carrier. If these are the same man he would have needed pasture for his horse(s), which this close may have provided. John Stokes. This was his only holding. There is no plan. Gervass Bas. He held 27 acres in three closes. The site is now occupied by an old cottage (much extended) the core of which could be 18th century (2 Long Acre East). The close is now occupied by housing on Pinfold (named for the town Pinfold which was nearby on the corner of Long Acre East and Grantham Road, immediately next to Widow Pacey’s. 248 (HG)	 This was Widow Pacey’s only holding. Mary Pedegreen. This was her only holding. Thomas Wright. He held 70 acres around the parish, only an acre of which was shared grazing - in Little Moor. He was listed in 1793 as a farmer. This is next door to what is now Porchester Farmhouse (311). John Chettle. He held 150 acres in the parish, none of which was shared grazing. He was listed in 1793 as a farmer. William Green. He also held homestead 241 (see above) and some grazing in Far Littlemoor. William Petty, the post master in 1793. He held another house at 276 (see below) and 15-acres including two closes, grazing in Meadow Moor, Meadow Menders and Far Littlemoor together with two gates onto Bull Moor. Samuel Johnson. This was his only holding. He may have been father to James and John who had some holdings. William Baxter. He had an acre of grazing in Near Little Moor. Samuel White held 73 acres. 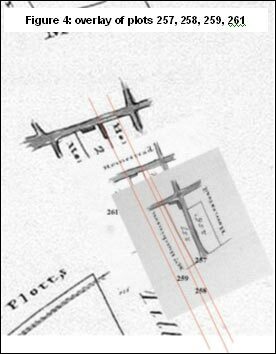 The plan shows two buildings; one may have been a barn. White was listed as a farmer in the 1793 directory. Thomas Richmond. He held 99 acres and was noted in the directory of 1793 but with no occupation listed in the directory. 291 (HSE). Richard Skinner. He farmed 122 acres including several closes shared with Askew and Little, some grazing in Meadow Moor and six gates onto Bull Moor. He was listed in 1793 as a farmer. In 1586 a Skinner held parcel 292. It seemed possible that the two Skinners would have been related and might therefore have occupied the same premises, but equally over such a time span one may have moved next-door! Examination of the boundary information in 1586 and the plans for 1796 makes this unlikely. Figure 3 shows the thumbnails for north Long Acre in their relative positions. Thomas Skellington. He had a one-acre close on Chapel Lane, an acre of grazing in Meadow Moor and two gates onto Bull Moor. In 1793 a Richard Skellington was a blacksmith, possibly his son. This would be consistent with the commonly held view of this site as having been a smithy. William Granger. He had small amounts of grazing in Meadow Moor, Meadow Menders and Far Littlemoor together with two gates onto Bull Moor. He had no separate closes. Samuel Wright. He held only six acres – one close described as a homestead (see 268) and grazing in Meadow Moor and Meadow Moor Menders with three gates onto Bull Moor. This was freehold land belonging to H Sherbrook esq. In 1586 it had been part of the freehold of the Porter family with a messuage, which is why we assume a house could have been here in 1776, for which there is no map. We have placed the house on the site of Falcon House which claims to date from 1769. The parcel of land carries no description in the terrier document. This is the only entry where house and homestead are specifically mentioned as separate items. It was occupied by William Doncaster (in future years the lane leading up to Providence House would be known as Doncaster’s Yard). The site is now occupied by Tealby House and Bradshaw’s Cottages (a 19th century conversion of a barn which may well have dated to the 18th century). William had just ¾ acre of grazing in Far Littlemoor. One of the Doncaster family of butchers and builders, he may have been the one of oldest members and in his retirement. Widow Foster. She held 167 acres in the parish. By 1793 her son John had taken over the farm. The successor building is Banks House, a large early 19th century farmhouse with many outbuildings to the south of the plot, but in 1776 there were two buildings on Long Acre; one was probably a barn (it could be the old barn alongside the present fire station although the thumbnail plan shows it in a different place but the correct orientation). Widow Hart owned the freehold of this 30 square yards plot for which there is no plan and for which we have assumed this location to honour the plot number sequence. It is the smallest plot to be described as a homestead and one wonders why it rated this description (as opposed to ‘house only’ as in many other similar cases). No other Harts are mentioned in the terrier lists. As there were no Harts in the 1586 survey perhaps this is the first record of a family that was to become quite well known in Bingham for the next 200 years. John Timm snr had just this homestead whilst his son farmed 107 acres (see 378). We know from newspapers of the time that it was the Marquis of Granby Inn. 258 (HSE)	 Mrs Hutchinson’s freehold was her only holding. Her son John ran Starnhill Farm (see 16). John Johnson. He held 15-acres – the homestead (257) and a home close on the east side of Jebbs Lane (part of the modern bowling club) together with two closes in East Meadow and one near Starnhill. James Horspool. He held 37 acres in five closes with an acre of grazing in Little Moor. The 1776 plan shows two buildings, one of which may have been a barn. The Bowling Club now occupies his homestead; the old barn converted into the clubhouse may date from the 1700s. He was shown as a butcher in 1793. This is listed as a house and brewhouse and in the occupation of Rebecca Bakeley who had 2¾ acres of grazing in Meadow Moor and four gates onto Bull Moor. Four Bakeleys are listed in the terrier; two are in the 1793 directory but spelled Beakley, as indeed it is spelled on a number of gravestones in the churchyard. 250 (HHC) Thomas and Charles Thaves. They had ? acre grazing in Little Moor. 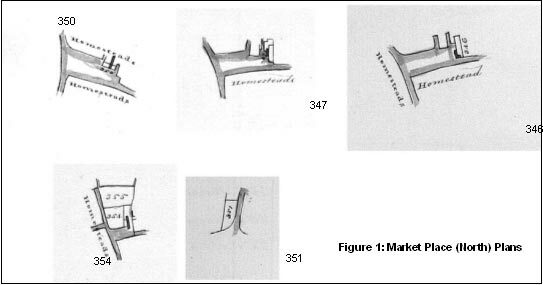 Thomas was a framework knitter in 1793. This was Mrs Needham’s freehold and no plan was given. However we know this plot was owned by the Needhams (see our web site page here). The present property (39 Long Acre) includes a very old cottage to the rear, and indeed the front part of the building is likely to be timber framed and could rank as one of the oldest houses in Bingham. Thus we have assumed Mrs Needham’s house would have been here. William Petty, who in 1793 was the postmaster. He also held 15-acres including two closes, grazing in Meadow Moor, Meadow Menders and Far Littlemoor together with two gates onto Bull Moor. He also held 308 – might one of his houses have been just the post office? George Beecroft. Despite it being termed a homestead, this 1? acre close was his only holding. Robert Grant’s freehold ½ acre homestead; he also had the bakehouse in Market Street (359) and 0.9 acre grazing in Far Littlemoor. Both this and 272 eventually became part of the Chesterfield Estate, so the Stanhopes must have been buying additional holdings when they became available after their original purchase. Grant was listed in 1793 as a baker. (on Tithby Road) John Bass’ freehold 1½ acre homestead. He had grazing in Meadow Moor and Meadow Moor Menders and he a rented house (278) in Church Street/Cherry Street. The deeds to 4 Long Acre refer to a marriage settlement in favour of (a previous) John Basse in 1663 which mentioned a cottage on this plot owned by his father Bryan, so we have assumed a house here in 1776. William Horspool. He was a butcher – a long line of Horspool farmers and butchers were in Bingham until the late 19th century. Horspool later leased plots 272 and 273 from the Estate. He held 20 acres in three closes. Samuel Parr. He was in the trade directory for 1793 (or his son?) as a farmer. He held over 100 acres. This is on the site of ‘The Paddock’ a modern housing development but with two barn conversions near Long Acre which might date back to Samuel Parr’s time. Mary Parr. She may have been Samuel’s mother occupying a sort of dower house in the corner of his holding. She had another homestead at 363 and held 20 acres in two closes and some grazing in Far Littlemoor. Elizabeth Skinner, the cooper’s widow. The property today is named ‘The Cooper’s Cottage’ and the Skinners held it for many years into the 19th century. Elizabeth had an acre of grazing in Far Littlemoor and three closes totalling 14½ acres. This was in the freehold ownership of Mr Hains. Today it is the Wheatsheaf Inn. In the upper story extension there is a brick dated 1779 with the initials NG. John Richards, the innkeeper of the Wheatsheaf died 22nd June 1798 (Nottingham Journal), was in the 1793 directory as an innkeeper (unspecified location) and thus is likely to have been Hains’ tenant. Hains had no other holdings. Being freehold there is no plan. Our 1586 map also shows it as freehold. We know the inn was run by a family named Gratton at the time. 265 (HSE)	 Richard Little. He held 127 acres around the parish in ten closes and shared grazing rights (with only sometimes one partner [Everitt Little] or two [Askew and Skinner])) in nine closes plus 5½ acres of grazing in Meadow Moor and Menders together with eight gates onto Bull Moor (the maximum any individual held). He was clearly one of the most important farmers in the parish. Only Everitt Little (see 290) was mentioned in the 1793 directory suggesting he may have been Richard’s son? This eventually became the site of Bingham’s first public school, set up in 1841 by Rev Robert Lowe on land donated by the Earl of Chesterfield. The present building has some old narrow brickwork, with a locally common half-hipped pantile roof, and could have been an eighteenth century barn on this homestead. There was a group of houses built ‘on the waste’, the first plot number of which follows close 158 whose position is fixed well by the plans. This was the northern boundary of South Field in 1586 and the steep slope up to the field was almost certainly incapable of cultivation and therefore ‘waste’. Whether The Banks had actually been a kind of bypass to the town is open to discussion. The original Nottingham Gate followed the line of Stanhope Way which meets The Banks at Tithby Road. The turnpike however followed the modern route of Nottingham Road and Long Acre. described as a Town House with no named occupant. Richard Booth. This was his only holding. John Atkinson. This was his only holding. Widow Graves. This was her only holding. William Foster. This was his only holding. 164 (HW)	 William Nowell. This was his only holding. He was a wheelwright in the 1793 directory. John Hutchinson, Starnhill with 265-acres. Widow Alvey, Brocker, with 25-acres. 221 (HSE)	 The description here is different to others – ‘house, barn and holmes’. This is the core of the modern Holme Farm and was in the occupation of Thomas Bowler who held 105-acres but was not mentioned in the 1793 directory. Plans for the three consolidated farm holdings are at figure 5. 11 (THG)	 The Turnpike House at Grantham Road/Granby Lane junction. This was held by Richard Darker and as tollkeeper it was his only holding. There is no mention in the terrier of a toll house on the Newark Turnpike where ‘Buggins Cottage’ was the toll cottage in later years. As in 1586, the development of Bingham town centre was constrained by the medieval town plan with its grid pattern of roads and lanes. Only Deadman’s Lane seems to have gone, but the 1776 survey does not give street names so we do not know when these may have changed. Many of the 1586 boundaries we showed in our conjectural map were derived from the 1776 map so it is difficult to demonstrate conclusively that boundaries had been preserved from 1586! However, the property boundaries thus generated did honour the areas quoted in the 1586 survey to within a +/- 5% tolerance, so we are confident that these boundaries do date back to at least the 16th century. The 1586 conjectural map identified the location of 78 dwellings. The 1776 town map shows 115. There were another four or five in the wider parish. A multiplier of 4.5 is used in some studies to convert number of houses to total population – this would produce a population of 525. Elizabeth Foster’s WEA group (which published “Bingham in the Past”) made three estimates based on Protestation returns of 1642 (573), Hearth Tax returns of 1674 (530) and number of communicants (Compton census) of 1676 (540). The Nottingham Journal in 1779 estimated the population as ‘less than 900’. There is insufficient information to be any more precise. The 1586 disposition of houses is compared on this map with that of the 1776 houses. Virtually all 1586 houses survived (in some form). New 1776 houses were built on previously undeveloped closes that had been tenanted by cottagers or farmers in 1586. The survey text described dwellings as either homesteads or houses, with or without gardens (and/or home closes in the case of the latter). Unlike 1586, no descriptions were attached to people; all are listed as ‘tenants’ rather than as farmers or cottagers although freeholdings are still identified. Only 8 houses did not have a garden in which to grow vegetables and perhaps keep chickens or a pig. A large number of tenants made up for having no other land by renting grazing rights on the moor land, perhaps for one or two cows to provide milk (and occasional meat?) for the family. Those with gardens presumably grew vegetables. Thirty five householders had no land or grazing rights at all. Some would have been agricultural labourers working for the larger land holders but most would have been tradesmen, shopkeepers, professional people etc. The trades directory of 1793 lists 80 people in 40 non-agricultural trades. 27 full names in the directory occur in the 1776 list of occupiers only 15 years earlier and could be the same people. The Universal Trades Directory lists 107 names who between them followed 41 trades (some practised more than one trade). The list of trades followed in Bingham is in figure 6. By linking names (sometimes surname only) with the Universal trades’ directory of 1791, only 15 years ahead, one can make some assumptions about the trade or occupation of between 27 (forename and surnames same) and 41 (surname only) villagers Figure 7. John	 Timm	 Maltster	 John Timm Senr. We also know from other sources that Daniel Stafford was a teacher. We know from the survey that there was a bakery (now 11 Market Place) occupied by Robert Grant and that Rebecca Bakeley had a brew house (at the NE corner of the modern Warner’s Paddock). There was Thomas Eden’s hop yard (north of the later railway line) and John Lee’s windmill at the top of what is now Tithby Road. This is shown both on the survey and on Chapman’s map of 1774; Lee lived in the cottage in Church Street next to the church. There had been two mills in 1586; the fact that there was now only one maybe a sign of increased efficiency or of reduced demand because of changing agricultural practices from arable to sheep. However, rising population and subsequent food shortages at the end of the century may have led to an increase in arable production and resulted in three windmills appearing on Sanderson’s map of 1835. John Pilgrim’s house was the Royal Oak (later the Chesterfield Arms (Church Street) and Mr Hains’ freehold was the site of the Wheatsheaf (Long Acre), which we know was operating in 1793 under the tenancy of John Richards. There were two more inns in 1769, run by Septimus Tinkler and Richard Whitworth respectively, but these names do not occur on the survey. They are likely to have been the Marquis of Granby and the Kings Head whose licensees in 1841 were of the same surnames. We know from the newspapers that Thomas Eden ran the White Horse in the Market Place (365 (HSG). The preceding paragraphs start to build a picture of the social structure of Bingham in 1776. Two large farmers (Thomas Hutchinson at Starnhill and Thomas Pacey in the Market Place, both with over 200 acres) growing commercial crops and/or raising stock for sale would have been at the top of the social strata with seven or eight middle ranking famers of 50 – 200 acres, also presumably producing commercially. In the newspaper notices for the 1770s and 1780s several were mentioned as opulent or wealthy farmers or graziers or both. Among them are William Hutchinson, Richard Skinner, Thomas Pacey, John Chettle, John Timms and William Moggs. John Needham is described as “a gentleman of large fortune”; John Bradshaw as a gentleman; William Brookes as a gentleman “skilled in Philosophy and Polite Literature”. Of Mr John Bates it was said, “formerly a plumber and glazier, but of late retired having acquired a handsome fortune.” Richard Oliver was a maltster of “Great business”, while in a newspaper advertisement for the living at Bingham rectory it was claimed that the rector had an income of more than £600 a year from tithes, making it the richest living in the county. The Porter family, who lived here until c1754 were significant freeholders with a large house and estate. The middle classes would have been small-holders and tradesmen with a few acres in the fields and/or attached to their house in the town. Some of the smallholders might have been self sufficient or even have sold some produce at market locally. Several, including younger members of the family, would have been labourers or house servants. A number of present day buildings in the town date from the late 18th century and could have been here in 1776 in some form. These include the Chesterfield Arms in Church Street with numbers 9, 11, 15b and the rears of 19 and 21, The Wheatsheaf Inn, Falcon House and Regency House in Long Acre. Several more have 18th century origins but with 19th century additions or frontages. Eleven houses were built ‘on the waste’. They may have been squatters’ cottages. Six were on the south side of The Banks (159–164) and three ((370-172) were north of Fair Close on Newgate Street. Waste land was owned by the lord of the manor, usually on town greens or wide grass verges etc. Although technically illegal encroachments the lord often allowed them to remain in return for a nominal payment.